This Tribeca condo at 195 Hudson Street is officially listed as a one-bedroom apartment, but the current owners have fully taken advantage of the 2,325-square-foot space and added a glass-enclosed sleeping area. It doesn’t have a window—or much privacy—but feels anything from dark and cramped due to those see-through walls. The windowed bedroom, too, is separated from the apartment by nothing more than floor-to-ceiling glass. Who needs privacy, anyway, when the apartment looks this nice? Tribeca is filled with well-designed lofts, but this space boasts a symmetrical zen-like elegance that is definitely worth checking out. 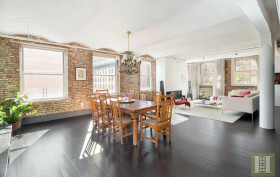 The one-bedroom unit is located at 158 Franklin Street on one of the neighborhood’s most desirable cobblestone blocks and is currently listed for $10.5 million. The interior space features low furnishings and eastern-inspired details–most notably a bed inset into the floor, reminiscent of the Beatles’ bed in their famous movie, “Help” (we can’t be the only ones who’ve dreamed of having that bed). 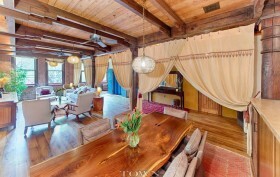 The loft recently underwent a complete renovation, and we like what we’re seeing. It’s time to get lost in a sprawling 3,525-square-foot loft in Tribeca’s esteemed Tower 270 condominium. We imagine being located in a prestigious white-glove building with three brand new gyms, a children’s playroom, and a landscaped roof deck is a pretty big selling point on its own. However, apartment #11F is next-level elite. 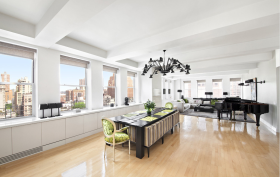 The $9.6 million unit has the mark of P & T Interiors founder Pol Theis, who created a sumptuous modern loft ideal for lavish entertaining, comfortable living, and—if you read the wallpaper—a little educational supplementing.